Richard Carter is an impressive man. 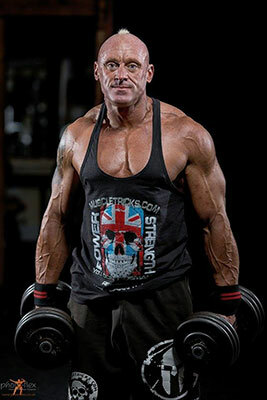 His physique is ripped with the sculptured forms of a dedicated body builder, and his acting ability means he can turn on a mean, scary expression at will. But despite the big, looming, angry mass of a man that he is, working with him was actually great fun. He was actually a very cool guy, easy to get along with, and not in the least bit scary. 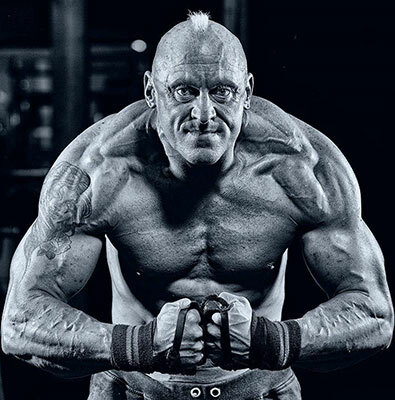 But those combined physical and performance talents made him the ideal candidate for Horrify Me's HULK project. 1. HULK is a genetic mutation brought about by man's interfering with things that should be left alone. A scientist playing god. A very clear and obvious reference to Frankenstein, or Jekyll and Hyde. 2. 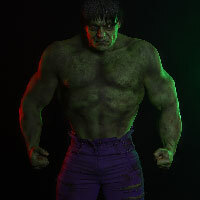 HULK is a transformation, a physical change from human to monster. This transformation is extreme, brutal, and violent. The transformation from man to beast is a staple of the horror diet, seen in the Wolf Man, The Fly, and many other horror classics. 3. 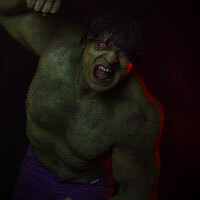 HULK is a character driven by rage, anger, fear, aggression and hostility. He is a negative reaction to a negative situation. The creature is often out of control, very brutal, causing untold damage as he goes about expressing his wrath. In HULK stories, he usually has to be given equally powerful villains to compete with, because if he attacked a human, the result would be utterly devastating. 4. The design of HULK is designed to frighten us. His skin is green, a completely unnatural colour for anything human. Green is the colour of nature, suggesting he is an unstoppable force of nature like a tornado or an earthquake. His bulk is so massive that it can do nothing but intimidate men. And the fact that he is virtually indestructible makes him utterly terrifying. Of course, Marvel tone down these design features by implanting just enough humanity that HULK doesn't cross the border into horror territory. He's a super hero, a very primal and unconventional good guy, there to entertain kids and deliver some sort of weird message of empowerment. But this friendly HULK is of no interest to me. I'm interested in the scary, primal rage that beats through the heart of this unnatural beast. In my mind, HULK is a supreme being of horror in terms of what he could be capable of, if his authors only allowed it. With all that rage, all that strength, and all that out-of-control power, this monster could be a force of destruction so terrible that the likes of Dracula, the Wolfman, Jason Voorhees, and any other horror icon you care to name, would be rendered insignificant alongside him. I'd wager that even the Alien xenomorphs would find the HULK hard to face-hug, and their acid blood would just run off him like water. How much more scary does he need to be for me to prove my point? But HULK is a Marvel hero, and he has a moral compass somewhere among all that rage and power. I get that. 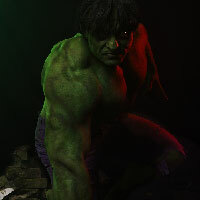 But I still wanted to take a look at MY version of the HULK and show him as a scary being, not to be fucked with. I wanted to show him in the dark, a mountain of muscle and dread that could rip a man apart in seconds. I wanted to show him with the blood of a victim on him but leave the actual violence to your imagination. 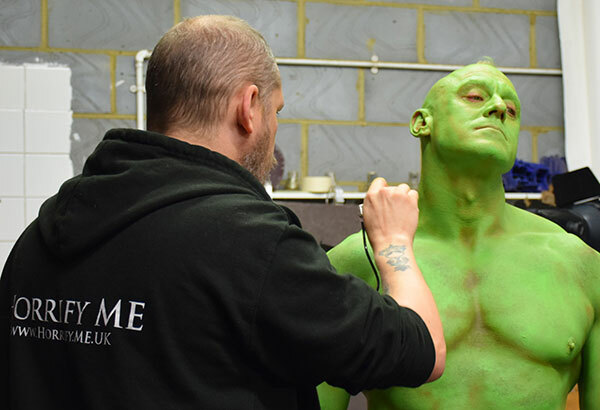 After conducting a head-to-toe body paint on Richard, the shoot commenced. 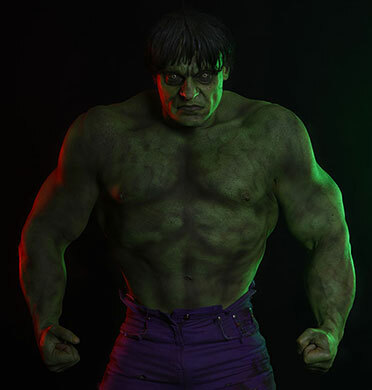 Richard is a huge guy but was not big enough to portray the classic image we now have of the HULK. This is because the HULK is too big for any human to achieve and stay healthy. HULK is more a caricature of a muscle man with impossible size to his limbs. So a lot of Photoshop work was needed to morph Richard from a big guy to a super-huge HULK. To be fair, Richard made a damn fine HULK and even if I didn't pump up the limbs in digital editing, he would have still been an impressive rendering of the character. But the extra bulk possible with Photoshop transformed Richard away from the man and into the monster. When I was a kid growing up in the 1970s, the TV series of the HULK was an exciting weekly show. 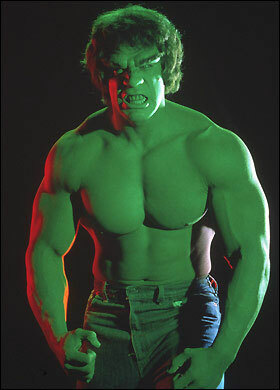 I have this enduring memory of a promo shot of Lou Ferrigno from magazines at the time, with a red backlight and a green filter. The result was a weird, otherworldly image of the HULK as a green muscle man with a red glow. I decided to apply the same red back light to my HULK to pay tribute to that old TV show. 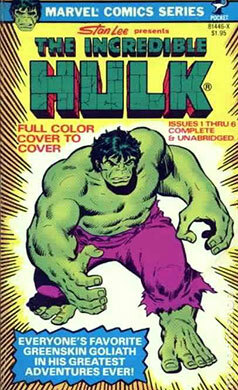 It was TV rather than comics that introduced me to the HULK after all. I did buy HULK comics as a kid, and this older, less complex mutant has stayed with me over the years. HULK would be a tremendous character of fear and horror if Marvel let him. But they won't; he's a family entertainment figure, plain and simple. 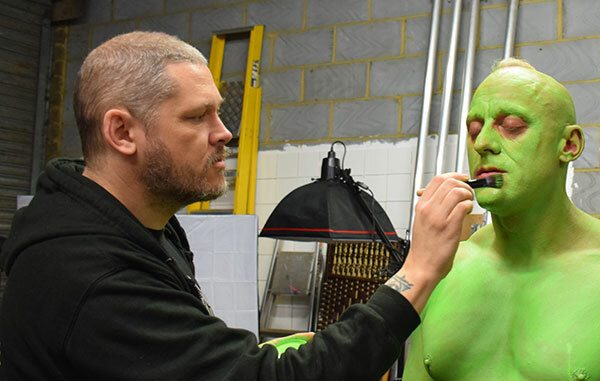 So folks, if YOU have ever thought the HULK is a scary dude then make the most of this photo shoot in which I attempt to see him through a filter of fear….